EA Access is a subscription-based gaming service by Electronic Arts. Initially pitched to Microsoft for use on the Xbox One. The service allows access to select games published by Electronic Arts, along with additional incentives. Players have the choice to either get a monthly plan which cost $4.99 or a yearly plan which cost $29.99. During the membership period, users have unlimited access to the full versions of a selection of games published by EA, dubbed “the Vault”. The games are downloaded to the console’s storage device and remain available as long as users continue their membership. If membership is suspended, access to the games is restricted, but all progress and game saves are retained. Users may purchase games available in EA Access outright, along with other EA games, at a discounted price. EA Access members can purchase DLC for Access or other EA titles at the same discount. EA Access does not require users to have a paid Xbox Live membership, although a Gold-level membership is required for use of any multiplayer features that are included in Access-enabled games. Lastly EA Access has expanded to include Xbox 360 titles via the Xbox One’s backward compatibility feature. 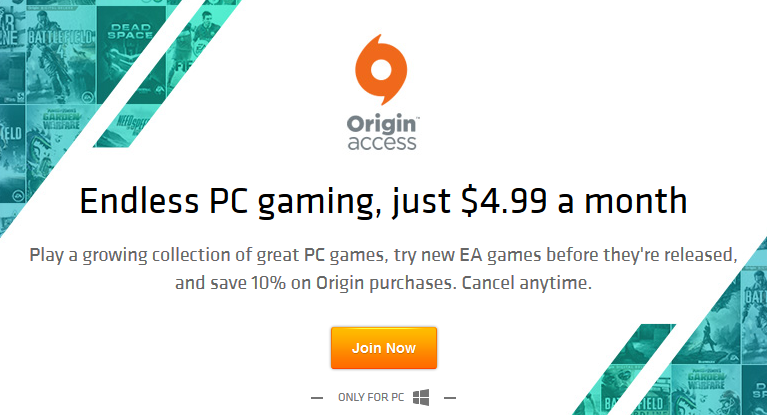 As for Origin Access It’s pretty much like EA Access but for PC. Tagged EA Access, Origin Access.